Looking for a buggy ride and a home cooked Amish dinner? Only $39.00/person. Just let us know 30 hours in advance. 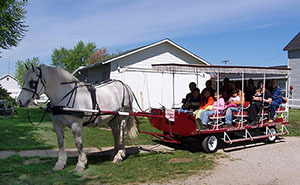 Clip-pity-Clop Buggy Ride that circles the town of Shipshewana in a leisurely 7 minute buggy ride.$6.00/person. 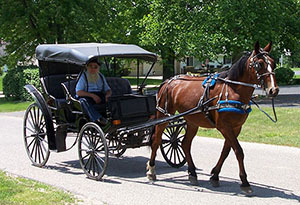 Enjoy a 15 minute buggy ride in the town of Shipshewana. Our local guide may narrate the History of this truly unique community – ask about the “Vision of a Lion”.$9.00/person. To see more of the beautiful farmland surrounding Shipshewana we suggest the 30 minute buggy ride. 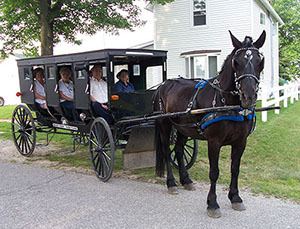 Our guide will narrate the sights and sounds of area Amish farms clustered along the back roads of Shipshewana.$36.00 trip for two, additional people only $12.00 each. Experience this “hands on” tour, a 20 minute trip by horse and carriage to our 70 acre working Horse & dairy farm located just outside of the town of Shipshewana where you will see Holstein cows be milked! We have farm tours daily at 4:00pm (closed Sunday). Our family operates a Grade “A" Amish farm where we milk Holstein cows twice daily at 5:00am and 5:00pm. We give you the opportunity to milk a cow by hand, taste fresh milk, help feed the calves, and take pictures of Belgian work horses. English and Pennsylvania Dutch are the two languages spoken on the farm. There are no house tours because this is an Amish working farm. This is a 1-1/2 to 2-Hour tour, $25.00/person; Children 6 years to 12 years half price, only $12.50/child. Group rates available! We have a "New Grand Star Tour" that includes a tasty, home cooked Thrasher's Family Style Dinner with an Amish family, plus the Four Star working Amish farm tour! Approximately 3 ½ to 4 hour tour. This tour is only $49.00/person, groups of 20 or more people get one free pass! OPTIONAL: Dinner only, Group, $29.00 per person. Contact us today for rates and availability!